Mary took half a litre of a very expensive perfume made of pure nard, poured it on Jesus' feet, and wiped them with her hair. The sweet smell of the perfume filled the whole house. Can you imagine the joy and excitement of Mary and Martha and all their friends? Lazarus had been dead but now here he is walking, talking and laughing amongst those who had been mourning. You see, Lazarus had fallen seriously ill, in fact so ill his life was in danger. His sisters immediately sent for Jesus but by the time he arrived, Lazarus had died. The sisters were distraught. If only Jesus had arrived in time Lazarus would still be alive. Jesus went to the grave and called out in a loud voice, "Lazarus, come out!" You could hear the gasp of surprise from the onlookers as a figure emerged from the grave wrapped from head to toe in grave cloths. It was Lazarus. Where there had been weeping there was now sounds of joy. Lazarus was alive! Once again, Jesus had turned a funeral into a celebration. Next we hear of Jesus having dinner with Lazarus. Martha is busy in the kitchen preparing the food as she always did. Jesus and Lazarus are chatting. Tomorrow Jesus would arrive in Jerusalem among the cheers of the crowd and jeers from his enemies. In fact, his enemies were ready to take extreme measures to stop Jesus. In a week’s time Jesus would be dead. Back to Jesus and Lazarus. Mary came into the room where the men were, carrying with her a bottle of the most exquisite and costliest perfume. The text says it was nard, an aromatic oil made from a plant in India. This was very expensive we are told that Mary’s flask of perfume cost about a year’s wages. What did Mary do with this expensive perfume? She assumed the position of a servant about to wash the feet of a visitor but she didn’t have any water or bowl or towel. 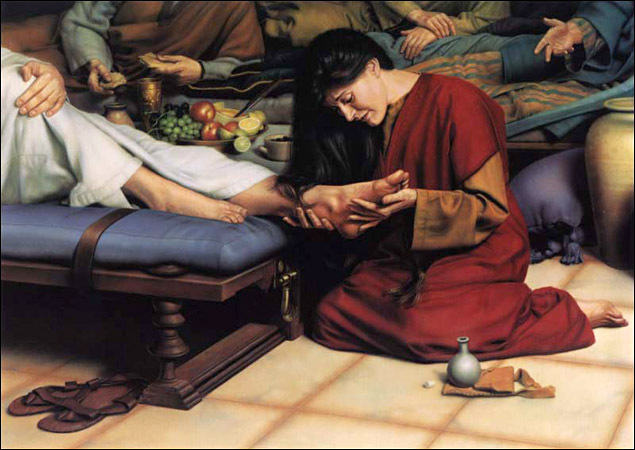 Instead she poured the very costly perfume on to Jesus’ feet. And then horror of horrors she let down her hair (only women of doubtful character would do that in public, especially in the presence of men), and proceeded to wipe his feet with her long hair. We are told the whole house was filled with the beautiful aroma. What made her pour her life’s savings on someone’s feet? What made her use such expensive perfume, when something cheaper would have been just as effective? Simply put – what Mary did was an act of devotion. It was a gift from her heart. She wanted to give the best she had, and the best she had was a flask of pure perfume. Jesus was someone very special, she loved him dearly, and she wanted to show it, so she gave him the best. That’s what happens when people love. When a husband loves his wife, he wants to give her the best and vice versa. When parents love a child, they want to give that child the best. When a person is devoted to a good friend, that person may even be prepared to put their own life at risk. One afternoon three children, two boys and a girl, entered a flower shop. They were about nine or ten years old, raggedly dressed, but clean. They gazed around the store and nervously approached the owner. One of the boys said: "Sir, we'd like some yellow flowers, please." The man immediately realized that this was a very special occasion. He showed them some inexpensive yellow spring flowers. The boy who was the spokesman for the group shook his head. "I think we'd like something better than that." The man asked, "Do they have to be yellow?" The boy answered, "Yes, sir. You see, Mickey would like 'em better if they were yellow. He had a yellow T-shirt. I guess he'd like yellow better than any other colour." The man asked, "Are they for his funeral?" The boy nodded, suddenly choking up. The little girl was struggling to keep back the tears. "She's his sister," the boy said. "He was a great kid. A truck hit him while he was playing in the street." The boy’s lips were trembling now. The other boy entered into the conversation. "Us kids have put all our money together. We got eighty cents. Would roses cost an awful lot, sir -- yellow roses, I mean?" The man smiled. "It just happens that I have some nice yellow roses here that I'm offering special today for eighty cents a dozen." The man pointed to the roses. "Gee, they’d be beaut mister! Yes, Mickey'd sure like those." The man said, "I'll make up a nice bouquet with ferns and ribbons. Where do you want me to send them?" One of the boys responded, "Would it be all right, mister, if we took them with us? We'd kind of like to, you know, give 'em to Mickey ourselves. He'd like it better that way." The florist fixed the bouquet of flowers, accepted the eighty cents and then watched the youngsters trudge out of the store. Even though he had not made any profit from the sale, he was pleased that he could be generous to those 3 children. They walked down the street carefully holding the bunch of yellow roses. They had spent all their pocket money so that they could give Mickey this last gift of love. With the bunch of roses, those 3 children were showing the same generosity, devotion, extravagance toward Mickey that Mary showed toward Jesus with her flask of perfume. Nothing but the best will do! That reminds us of God’s love toward us, only his love is more perfect and far greater than ours can ever be. Last week we heard about God’s extravagant and never-ending love for us when we heard Jesus’ story of the man and his two sons. Even though he was terribly disappointed in his two sons – one had cashed in his share of his inheritance and wasted it all on riotous living and the other couldn’t see why his father was so generous with his love and so willing to celebrate the return of such a failure. how lavish he is with his forgiveness. He loves us even though we rightfully deserve nothing from God at all. And today we hear of Mary who realises how much love Jesus has shown to her to Lazarus and to Martha. She wants to demonstrate in a practical way how much she is devoted to him. She gives boldly of the best that she had, just as Jesus will give himself boldly in his devotion for us when he is raised on a cross on Calvary. We are now just one week away from Holy Week which starts next Sunday with Palm Sunday, the day Jesus rode into Jerusalem on a donkey. This text has a special message for us as we draw near the end of the Lenten season. Firstly, it reminds us what true devotion is. As Mary knelt at Jesus’ feet in the posture of a true servant we are reminded of what happened at another meal – the Passover – when Jesus was eating his last meal with his disciples. Out of true love and devotion to his disciples he knelt before them with a bowl of water and towel and proceeded to wash the disciples’ feet. Jesus came into the world to be our servant, to serve us because of his extravagant love for us. In true service to us he gave his life so that we might gain life – a new forgiven life, a new life and new relationship with God, a new future life in eternity. Secondly, Mary’s extremely generous act of devotion reminds us that Jesus did not hold back his love for us. Just as Mary gave of the best of what she had, even more so Jesus gave the best of what he had to offer – his life. Out of his complete and total love for us, he gave up everything so that we could be certain of life forever in heaven. Thirdly, as we picture Mary giving so much to her Lord because of her love for him, we are led to ask ourselves, how extravagant has our devotion been to our God and Saviour? God's generous gift of Christ should bring out extravagance in the way we give to our God. the way we encourage one another to be regular in our worship. Mary’s unselfish love for Jesus calls for unselfishness in us in all areas of life – that kind of unselfishness that leads us to that extra bit and go out of our way to serve those who are facing hard times, the sick, the sad, in fact, anyone who needs our love. Judas was concerned that Mary had been far too extravagant in her demonstration of her devotion to Jesus, but Jesus commended her. She gave unselfishly and likewise we are challenged to give of our money, our time and ourselves generously as a way of expressing our thanks, our love and our commitment to our Lord and Saviour. or I knew I would feel guilty if I didn’t? When was the last time I threw caution to the wind and went ahead fully committed as I gave of myself, my skills and the material blessings that God has given me and used them generously and sacrificially to serve my church and so serve others?" And finally, Mary’s complete devotion to Jesus makes us ask us as a church – how well have we made it quite clear that the love of Jesus is what guides and motivates us as a church. When people look at us as a church, do they see the kind of do anything, no matter the cost, take a risk kind of Christianity or do they see people who like to stay within what is comfortable and safe. When Mary knelt before Jesus and poured perfume on his feet, she came in for some pretty severe criticism especially from Judas. Showing love and commitment to Jesus as Lord and Saviour always means taking a risk. Love that doesn’t count the cost is the kind of love to which we are called. Indeed it is the kind of love that Jesus himself showed us, when he, on the day after Mary anointed his feet and dried them with her hair, rode into Jerusalem and gave himself up to death. Lent reminds us that we have limited our love because the cost has been too high. That is why Jesus came. He came to forgive us and to give us a fresh start.